The Province o Mendoza (Spaingie pronunciation: [menˈdosa]) is a province o Argentinae, locatit in the wastren central pairt o the kintra in the Cuyo region. It borders tae the north wi San Juan, the sooth wi La Pampa an Neuquén, the east wi San Luis, an tae the wast wi the republic o Chile; the internaitional limit is marked bi the Andes muntain range. Its caipital ceety is the homonymous ceety o Mendoza. Coverin an aurie o 148.827 km², it is the seivent biggest province o Argentinae wi 5.35% o the kintra's total surface. The population for 2010 is 1.741.610 inhabitants, which maks it the fift lairgest populatit province o the kintra, or 4.35% o the total naitional population. 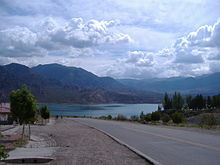 Potrerillos Reservoir, Lujan de Cuyo. The province is dividit intae 18 local govrenment auries cried depairtments (Spainyie: departamentos). Each is dividit intae ane or mair destricts, an haes an Executive Depairtment (led bi a mayor or intendente) an a Deliberative Depairtment (legislatur) tae run local services. The mayor is electit bi a simple majority o the popular vote ivery fower years, while hauf o the Deliberative body is renewed ivery twa years (re-election is alloued in baith cases). The depairtments can mak regulations in accordance wi the provincial constitution an the Organic Law o Municipalities, but financially canna levy taxes, but anerlie chairge for services. The maist populous ceeties athin a depairtment mey hae citizens' committees appointit bi the municipal govrenment tae perform certain functions. Wikimedia Commons haes media relatit tae Mendoza.